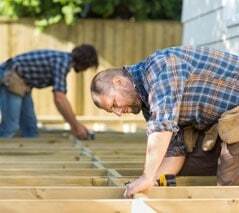 Finding a tradesperson for your garden decking build can be tricky because decking installation is fairly niche & can cross into a number of trade disciplines. Often gardeners will work on many aspects of the garden, but they might not have the skills required for the installation of decking or fencing structures. Landscape gardeners, builders, joiners & carpenters (chippies) can all build decking depending on their skillsets. Those who work in any of these disciplines are likely to be suitable to help with your build – the important thing is to qualify that they have the right skills & aptitudes to do a good job. This guide will teach you how to find prospective installers & the questions you should always ask before moving ahead with your build. Section 1: Where can I find someone to install my decking? Section 2: What should I look for? Section 3: What should I do if something goes wrong with my build? Most people will use Google to find local decking builders who operate within their area. Top Tip: A Google search on ‘decking builders in [your location]’ will usually reveal a number of tradespeople who fit decking in your local area. Those who specialise in decking are likely your best bet for good quality work. Their website is very simple & easy to use. It’s 100% free for you to create a new job listing – they make their money from the tradespeople who use the site. After listing your job, tradespeople will get in touch & provide you with quotes for the job. This is great as it means you don’t need to chase fitters individually. As it’s highly competitive it also means you’ll receive fair quotes & know that you’re getting the best possible price. Rated People also has its own reviews system – so you can ratify that the person you’re working with is trustworthy. As your chosen fitter knows you’ll be rating him after completing the job, they are also more inclined to do a thorough job. Simply visit their website to get quotes for your build. Under the ‘create a job’ section, select ‘Gardener / Garden Designer’ to help with ‘Wooden Decking’. From there you can follow the simple 3 step process on the site to list your job and start receiving quotes. Even if you’re only canvassing for quotes to understand costs, it’s worth setting up a job on their site. You’re under no obligation to take it any further if you don’t wish to – and it won’t have cost you anything. Trust Mark – non-profit organisation licensed by the UK government. Helps you find local tradespeople who are endorsed by government endorsed standards. Trust A Trader – recommended as tradespeople need at least 5 verified references to be included on the site. Users can also filter by location. These websites also provide reviews – but you should always be cautious that some reviews may have been faked or manipulated. Like most things you read on the internet – you should take these reviews with a pinch of salt. No matter their core discipline, finding the right match for you & your garden is crucial. While the majority of tradespeople out there are hard-working honest folk – the odd one or two can & will try to pull a fast-one! As such it’s so important that you approach multiple tradespeople or companies & compare them against one another before making any decisions. Whatever you do – don’t just choose the first deck builder you speak to! Chances are you won’t get the best price or quality of build. Top Tip: If you’ve found a potential tradesperson or company you’re considering working with, before speaking to them make sure you try a quick Google search on ‘[tradesperson/company name] reviews’. Depending upon their level of experience, this will hopefully bring up some reviews from people who have previously worked with them. If there are a number of bad reviews under their name, take it as a warning that you might want to stay away. Price: getting the best possible costings for your build, without compromising on the quality of the end-product. Experience: finding a reliable tradesperson or company who have the right skills to ensure a competent, high-quality build. Timeframes: ensuring that the company or tradesperson you choose can deliver the project within agreed timeframes. To most, costs will be the most important factor in their decision-making process. FAQ: How much will my decking cost? Unfortunately there is no fixed answer on this one, which is why shopping around is so important. A study by Quotationcheck.com found that a 15² Metre structure could cost anywhere between £950 and £3,250 depending on location, type of tradesperson (big companies charge more than one-man bands) & material costs. Our experts recommend that you should budget a minimum of £70 per square metre for a basic structure – and work upwards from there if you are planning a more advanced build with higher quality materials. Advanced decking fitters who take on complex jobs can be known to charge upwards of £220 per square metre. Those who shop around will always get the best price for their project. Did you know? Studies have shown that searching the market for 3 or more quotes can reduce project costs by up to a third! Materials – the quality of materials you have chosen for your structure. Eg. timber frames are going to cost much less than premium hardwood structures. North/South Labour Costs – as with many things, manual labour generally costs more in the South of the UK than the North. Build Size & Complexity – the bigger your structure, generally the more you’ll pay for materials. If your structure takes on complexities such as changing levels, balustrades, multiple access points – you can expect to pay more. Top Tip: When you first speak to tradespeople, be sure to let them know that you are speaking with a number of other suitors & canvassing for the best possible price. This will encourage them to give you the best, most competitive price they can. You will need to take all of this into account. If you can’t find a quotation that fits your budget you can always look at self-build options which will reduce costs significantly. What will the costs of the entire decking project be? It’s crucial that you know this before agreeing to move forward. Never accept verbal assurances that the project will cost “roughly £X”. Verbal agreements hold no legal sway should anything go wrong & could bite you in the back-side come the end of your project when an unexpected payment is due. How does this cost break down into labour & parts? Understanding this will allow you to compare & contrast the fees for labour charged by different parties. It will also allow you to challenge any costs for parts that you don’t agree with. A quick Google of various parts can help you understand if you are being overcharged or getting a good deal. Do you give a written estimate, quotation & contract? As above – never simply accept verbal assurances. Equally so – never accept only an estimate. An estimate is not an indication of the final project cost, it is only an estimate of what it might cost. You may want to change some elements of your decking build after seeing a cost breakdown in your estimate. Once you’re happy to move past this stage you should always ask for a final detailed quotation which includes all work to be done & by what dates, a breakdown of parts & cost, safety arrangements, disposal of wood cut-offs & rubbish (important), hours of working etc. To fully protect yourself, you are also well within your rights to ask for a written contract signed by both parties. With decking projects, it is usual to pay for the materials on delivery & the labour costs in arrears (once each phase of the work has been completed). If this is a big job, you should agree to break the project into step payments. These need to be precisely defined & agreed upon by both parties. You should agree what percentage of the overall project cost you will retain until the project has reached satisfactory completion. This is very important! You should always reserve at least 10% of the overall cost for the final payment. Any decking builder worth their salt should be happy with these terms. How will I pay for the work? Never agree to pay in cash. If you end up in dispute, you will be in a very weak position. Instead, you should look to pay through a recorded method such as bank transfer, cheque or credit card. If they will accept credit card (admittedly this is quite rare) your card provider will be jointly liable for the payment which should work in your favour should there be any dispute. Finding a deck installer with the right experience is crucial. You need confidence that the people you’re working with have the skills and competencies to get the job done to a high standard. Remember that experience costs money – but it’s often worth the investment. A competent decking fitter is worth their weight in gold. Don’t risk such an important build with a shoddy tradesman. It’s just not worth the hassle. Pay that little bit extra & remind yourself that this is an investment in your property; you’ll get the money back in the long-run. Do you have any examples of previous work? What we’re looking for here is evidence of proficient, high-quality work. It helps if the tradesperson is able to show you a back-catalogue of previous decking projects with varying levels of complexity. Ask questions about how much these projects cost, how long they took, what difficulties did they come up against? Do you have all the necessary trades & skills in-house with an experienced team or do you hire casual labour & sub-contractors? If it’s the latter – this should raise alarm-bells. Preferably you shouldn’t want your project outsourced to casual labourers who might not care about the standard of work (though this is not always a problem, provided the right guarantees are in place). What experience & qualifications does the person carrying out the build have? It’s not necessarily important that the person carrying out the build has specific qualifications. However we are looking for a level of experience that gives us confidence they’ll do a good job. It’s usually preferable to work with those who have been in business for a longer time period. Not only will they have come up against projects like yours in the past; but they have established a clear run of business in the past that has allowed them to operate for a long period of time. Established decking builders have a reputation to keep and are much less likely to come under the financial difficulties which are often experienced by new traders. The key here is in the wording of the question. Our prospective decking fitter might have worked on similar projects before, but we want to know that they can work on a decking project with the same levels of complexity as this build. Could you give me the details of some previous customers you’ve done work for so that I can contact them? All tradespeople worth their salt should have details available of those happy customers from projects gone by who are willing to provide them with a reference. Preferably, if you can speak with someone who had a decking project completed by our prospective fitter, this should give you a much better idea of what to expect. If my structure requires Planning Permission and/or needs Building Regulations Approval, how do you deal with this? Are you on the Competent Persons Register? This is very important. Read our guidelines to help decipher whether you’ll need planning permission by following this link. If you think this is something that is going to impact your build, then you need to figure out who is going to take ownership of this. Similarly, it’s important that your build follows any UK Building Regulations. If the prospective fitter is on the Competent Persons Register, they will able to tell the local authorities about your plans & can deal with issues such as objections on your behalf. The final principle you need to understand from any prospective installer is how quickly they will be able to deliver your finished project. If this is not made clear & agreed upon in the correct way, builds can drag on for months as fitters prioritise other more urgent projects in favour of your own. Sometimes new projects can be started & then left unfinished in the elements for weeks on end until the fitter is harassed into getting it done. Obviously this is the worst-case scenario – but it shows how important it is to ask the right questions during your search for the right person. Top Tip: if you can be lenient on your deadline, try to compromise. Often you’ll get a better price & your project shouldn’t be as rushed. Specifically, when can you start and finish the project? Always try and cross-examine your prospective decking fitter on how realistic their start dates are – what else do they have on that might affect this start date? Ask for milestones to be put in place as part of your agreement & build them into your quotation and/or contract. During the build, this will allow you to understand where deadlines are being missed & work is falling behind. How many jobs do you have on at the moment? Try and compare this with the size of the workforce. Lots of projects at once for a small workforce may mean that they’re over-stretched & could spell disaster for your build. What times of the day will you start working & when will you finish? This is obviously important to know anyway for practical reasons – but it also helps to build an expectation from the very beginning. If your fitter is allowed to come & go at ease, they might not feel the weight of expectation as when these things are agreed in advance. If I agree to working with you – what will be the next steps? Try and get a feel for the process you will need to go through. What does the fitter need from you before they can get started? Do they provide plans & consultation on the design or do they expect this from you before they can get started? The better you understand the build process, the more comfortable you can feel that they know what they are doing & can handle the project with little guidance. It’s always important to be realistic about your project. Decking builders are only human – projects can run into bumps in the road & sometimes project timeframes will need to be extended legitimately. As soon as you see something you’re unhappy with or you don’t like the look of, you should bring this up with your fitter immediately. It’s important to avoid the slippery slope that can open up when you accept cut corners or little indiscretions. The longer you leave something, the more difficult it will usually be to sort it out. Top Tip: If things end up getting more serious & you end up in dispute with your decking fitter, the FMB & Quality Mark both run arbitration services where you can go to seek help. You should always aim to avoid having to go to court – legal advice & representation is never cheap & will only add to the costs of your project. It could also mean you end up with a messy, half-finished project in your garden until your dispute has been resolved.